Great post! I always love to see peo­ple mak­ing good use of my fin­ger­ing thing. I had a sim­i­lar sto­ry with a par­tic­u­lar­ly bad bas­soon fin­ger­ing chart that I was try­ing to use for a wood­wind meth­ods class–that expe­ri­ence led direct­ly to the cre­ation of the fin­ger­ing dia­gram builder. I have also been exper­i­ment­ing with Lily­pond late­ly, so I was espe­cial­ly pleased to see you get such nice results using the dia­grams. Lily­pond is an incred­i­bly pow­er­ful tool (and mul­ti-plat­form and FREE), but a chal­lenge to use. These charts look great–I’ve down­loaded them for my own use and for shar­ing with my stu­dents. Thanks so much for mak­ing them avail­able! Thanks! Hope you get some good use out of them. I’ve often heard peo­ple com­par­ing Finale and Sibelius by say­ing that Finale is much more pow­er­ful, but hard­er to use as a result. I think the same thing could be said about Lily­Pond com­pared to Finale. Lily­Pond can pro­duce just about any­thing you’d want in the realm of musi­cal nota­tion, and do it beau­ti­ful­ly, as long as you’re will­ing to spend time fig­ur­ing out how it works. Two cur­rent lim­i­ta­tions of Lily­Pond that I ran into with this project are lim­it­ed sup­port for embed­ding graph­ics files and pre­cise align­ment of notes. 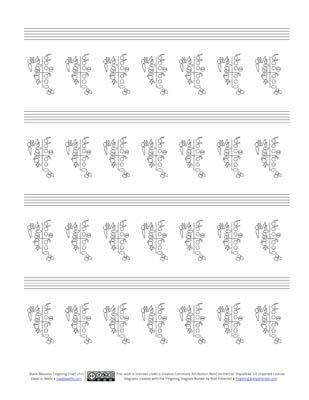 For instance, there’s no way to sim­ply cen­ter a whole note in a bar — some of my spac­ing is a lit­tle odd as a result. Noth­ing that real­ly offends the casu­al eye, but it’s enough to bug me :-). Thank you for post­ing the fin­ger­ing charts. I’m a third year bas­soon­ist but I for­got how to play some of the high­er notes and I lost my chart. All the oth­er chart’s I found had wacky fin­ger­ing for the notes I can remem­ber, so they were no help but yours helped. Prob­a­bly too late to help — and you may dis­agree — but Lind­say­hee­som, you might sim­ply use the C# trill key on top of the C# fin­ger­ing. Gra­zie! I am an aspir­ing junior at col­lege and con­sult­ed the web for excerpt woes :).